Fuel Card Services is proud to showcase its ongoing support for the wonderful work that continues to be carried out by the dedicated staff at Pendleside Hospice. Offering much-needed care to enhance the quality of life for people facing life-limiting illnesses, the hospice plays a crucial role in supporting not only those suffering from illness, but also in being there for families and loved ones in the most difficult of times. The hospice offers specialist palliative care to patients in Burnley and Pendle and, as a charitable organisation, is wholly dependent upon the goodwill and generosity of the public to continue its work. 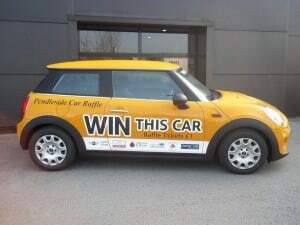 As such, Pendleside Hospice's Annual Car Raffle is a perfect opportunity for people from across the country to lend their support, while also having the chance to win the top prize of a brand new Mini One, or a cash alternative of £8,000. Anyone wishing to enter can do so either via the hospice's website at http://www.pendleside.org.uk/ or by calling 01282 440 120. Tickets cost just £1 and the money raised will provide the necessary funding to deliver welcome respite to vulnerable patients and families in the months ahead. The hospice currently requires approximately £3.8 million per year to run, with the vast majority of this money being raised through charitable donations. Grant funding for approximately one-quarter of this figure comes from the local NHS East Lancashire Clinical Commissioning Group, but around an additional £2.6 million is needed every year. This is why the ongoing support of the public is essential, so here at Fuel Card Services we are encouraging as many people as possible to buy tickets to this year's raffle and to also give generously when they can.